The Worlds Slimmest and Lightest Voltage and Frequency converter is rugged, yet full featured. At only 2.36 inches (6.0cm) in depth and 10.67 lbs. (4.84 kg) in weight, the XS-05 General Application can be installed on to an appliance or installed nearby, easily hidden from view. The XS-05 uses the overseas utilities electrical power to regenerate a new power that not only has the correct voltage and frequency, but through various filters and levels of control, acts as a voltage regulator that eliminates surges and transients. A power factor corrected input (PFC) provides harmonic filtering on the input by removing voltage and current distortions that may be caused by the appliance. The XS-05 provides the appliance with a high quality, constant, and noise free electrical output of 120v~60 Hz – anywhere in the world. An appliance intended for the USA is designed, manufactured and tested to operate in a 120v~60 Hz environment. As appliances have evolved in electrical sophistication and government efficiency standards have continuously become more stringent, engineers are forced to design each individual component, and the unit itself, to operate in the substantially more efficient 60 Hz. Installing a step-down transformer to power a 120v~60 Hz designed appliance from a 220v~50 Hz grid will cause the appliance to operate at 50 Hz. At best – it functions but not properly. But most likely, the appliance will have a shortened product life, failed components and unforeseen damage resulting in catastrophic failure. In other words, the XS-05 does not power the appliance like an installed transformer. 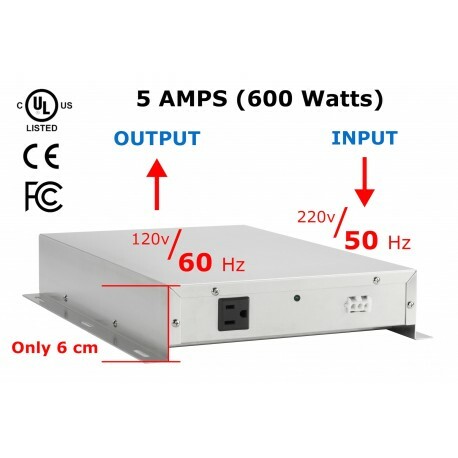 It is an adapter that converts 50 Hz utility power, providing an appliance with the correct voltage and frequency of 120v~60 Hz that it was designed and tested for. The XS-05 is a rugged full-featured device. Its specialized connecters provide for secure and safe installation. Its slim, lightweight design allows it to be mounted onto an appliance, or nearby via the included mounting plate. XS-05 is a full-featured sine wave output regenerator that produces new, clean, and constant AC power; eliminating line noise and ensuring optimum performance. It is capable of providing 120v~60 Hz electricity for running a single household appliance (up to 600W). Through sophisticated electronics, as well as input and output EMI and RFI filters, it produces continuous power at over 92% efficiency and with output Harmonic distortion below 3%. High levels of regulation ensure 120v~60 Hz output with fluctuations below ± 2% (typical less than 1%). The XS-05 has sealed, solid-state electronics that protect against humidity and dust, ensuring reliability and a long product life. Not only will electrical equipment perform better, but the XS-05 also acts as an advanced voltage regulator, which fully protects equipment against voltage irregularities such as under INPUT voltage as low as 180Vac and over voltage as high as 265Vac and provides an appliance with inrush surge protection of up to 150 Amps. Audible alarms notify overload, short circuit and temperature. The XS-05 meets International Standards. Even though this device would probably not be used in the USA, it also comes with UL and FCC approvals, giving the manufacturer/installer and the end user the confidence that their appliances, which meet these safety standards, are connecting to a device that is also meeting these safety standards.